One of our most popular products is business cards. 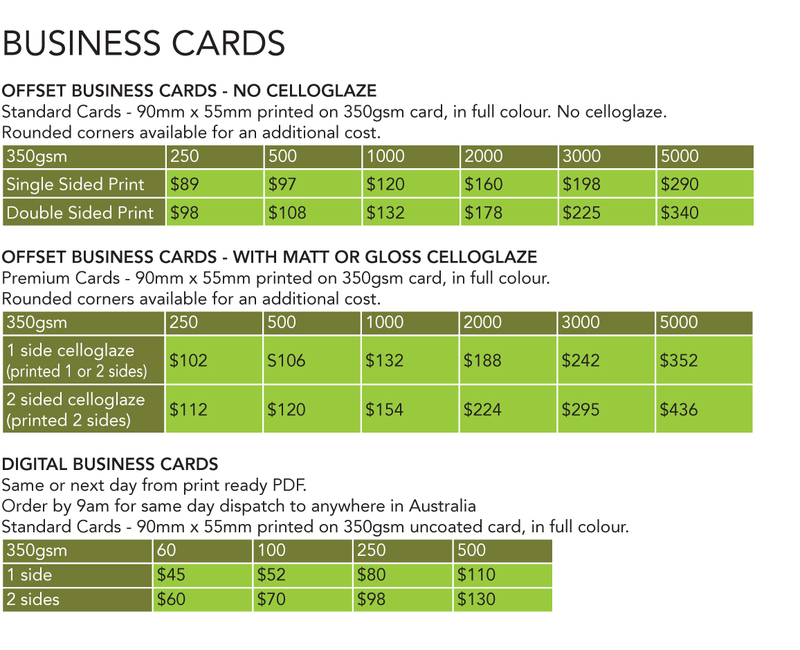 Everyday we do lots of business card printing for Newcastle NSW local businesses and companies throughout Australia. We have a range of finishes and sizes available suitable for every business. Need a short run quick? Then consider our 24 hour (sometimes less!) quick turnaround digital printing runs for batches as small as 60 cards. If you have a few extra days up your sleeve, then our high quality offset printed business cards are a cost effective alternative. Printed on 350gsm card, with the options of matt or gloss celloglaze, these are very popular and suit most businesses wanting to make a good impression on their customers. A business card can be the most important first impression you have with your customers and you don’t want to portray an unprofessional image. Your business card should reflect a positive image of your company and show all the things you stand for. Let us do the graphic design for you to make your cards really stand out. Supplying your own artwork? See our handy templates and specifications page to make sure your artwork is print ready. Our standard business cards are 90mm x 55mm, however we can do custom sizes on request. Additional charges may apply. Contact ONA Print for all your business card printing in Newcastle.